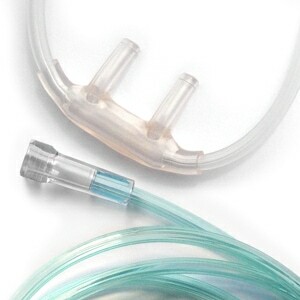 Comfort Soft Plus cannula nasal prongs are slightly curved to enhance and promote proper alignment on the face; and the included 14 foot tube is green for increased visibility and safety when in use. Timely delivery and my mom is very happy. Although the slide tends to fall down. The order arrived as promised and the product, canulas, were fine. I'd say they are not quite as soft as another brand I have but they are fine. Also, there was a plastic smell to them so I rinsed one and aired it for a few days before using. That seemed to help. Love that I can place order and have so quickly. Excellent quality. Ordering was a breeze. So glad I found this website. Easy to order and for free shipping arrive quickly. Best cannula I have ever used!! As described at a great price. I ordered the cannula for my husband's oxygen machine. The order was processed quickly, it arrived on time and was a great price. I have no complaints at all and would purchase from DirectHomeMedical.com again. Quality item. Arrived in good condition. Very soft material. Installed easily. I like the feel though they tend to twist a lot more than others. Service has been excellent so far. Just what I ordered. Very satisfied. Smooth transaction. THANKS. 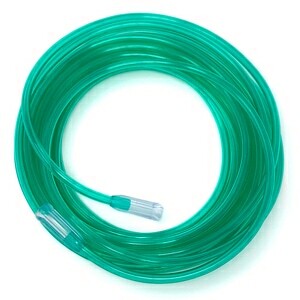 I ordered the longest So-Soft available because my transport chair (which I use a lot in the kitchen)kept running over the connection on the shorter hose and eventually mashing the connector or I couldn't roll over it. The longer hose has eliminated that problem! This hose may cost a bit more but it is SO WORTH IT! This is the first time I've used a 14' cannula and the 7' make a world of difference. This is also the most comfortable cannula I've used. It will be the only one I purchase now. I`m very happy with the way the nose piece feels.It`s soft and it doesn`t irritate my nose. There is just no comparison between these canulas and the ordinary ones! My nose doesn't get so like it used to when all I had was the standard canula. I'm on oxygen 24/7 so it means a great deal to me to have this comfort. This 14 foot tubing is great. It reaches most anywhere in the room and is very soft, non kinking where it counts. I will buy these again. I needed a cannula longer than 7' but not super long. I also wanted the super soft kind over the ears and across the face. These 14' cannulas are perfect. very soft. hardly know your wearing it. I like that it is very soft on the nose. It constantly wraps around it's self. Have to take it off and un-wrap it all the time. The little round plastic thing that covers the 2 pieces of the cannula will not stay and the small tubing is constantly getting twisted around. I travel back and forth to my children's home on a regular basis and these 14ft cannula's are fantastic. I will be buying these all the time from now on. one of the most comfortable tubing for the nose,got a good night sleep with it. This tubing is just the right length, and the facial part is especially soft and comfortable. I'm very pleased with it. 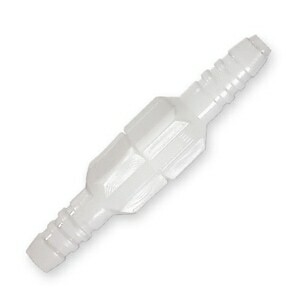 The 14' length cannulas are difficult to find, these are of excellent quality with reasonable pricing. I will be purchasing more as needed. The name says it all "supersoft" because it really is the softest cannula I have found out there in the marketplace. The 14 ft. is just right in the bedroom and very comfortable. Clear part of hose is too small and soft; nasal prongs too small for satisfactory oxygen flow. Will not order this item again. The cannula works very well and it is soft. I had a problem with the 02 supply tube coming loose from the nose portion of the cannula but was able to reinsert it. It has come loose a couple of more times but is easily reinserted. Great super soft cannula. Wear everyday. This is the best tubing in the world. Very soft and comfortable you hardly notice it's on even when you are laying down! I prefer the nasal cannula (adult) high flow 1600HF 14ft The soft tangles to freely. Is loud, making it difficult to sleep. I really love your SuperSoft/Comfort Soft Plus Nasal Cannulas. I discovered them, quite by chance while I was in the Coronado Hospital several months ago. Now that I have found your company...well, there's no looking back! !